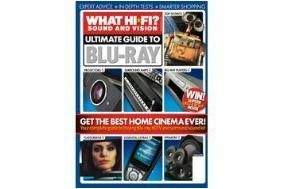 Ultimate Guide to Blu-ray on sale now | What Hi-Fi? The Ultimate Guide to Blu-ray is packed with essential reviews of Blu-ray disc players, home cinema amplifiers, surround speaker packages and subwoofers. Naturally, you'll also find recommended high-definition TVs and projectors to take full advantage of the Blu-ray experience, with suggested Best Buys to suit every living room and budget. You'll find in-depth tests of more than 150 home cinema products, including all-new tests on cutting-edge kit from home cinema star names like B&W, Marantz, Onkyo, Pioneer, Sony and Yamaha. We've also included reviews of the 50 Blu-ray discs you've got to try for their fantastic sound and vision quality, and you'll also find everything you need to know about high-definition surround sound on Blu-ray disc, the art of custom installation, and even all those essential extras that can help even the best sound and vision kit perform that bit better. What's more, we've got three £4000 Blu-ray systems up for grabs in our exclusive Ultimate Guide competition here on whathifi.com.